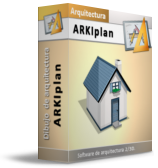 ARKIplan is drawing software which acts as a plug-in inside your CAD program. If you are looking for specific architectural software which keeps your way of working and design, it is what you are looking for. Our purpose is to give you the possibility of working in ZWCAD but easier, faster and enjoying lots of new functions. One of the greatest advantages is that you do not really need to learn anything new because you are still working in your ZWCAD environment. To sum up; ARKIplan is a complete architectural tool’s package which improves your efficiency in drawing, modelling and data tasks. ARKIplan makes you save a great deal of time and gives you more time to design! 2. DOORS, WINDOWS AND WARDROBES. Configure, define and edit every kind of door, window and wardrobe. You can introduce them in your drawing in a fast and easy way. (At the same time the block insertion generates a void in the wall. 3. PILLARS AND STAIRS. Drawing and edition. Insert in just one step stairs and normalized structural elements. Just defining your preferences you will have any kind of stair which will also have 3D attributes. 4. ROOFS. Design and edition. Design a roof has never been easier. Just introduce the kind of roof, the gradient and the contour and you will have your roof in just one click! 5. WOODEN STRUCTURES. This application gives you the possibility of design wooden structures for building roofs. In addition you can ask for a summarized or detailed list of materials and components. 6. DIMENSIONS. Forget about get plan dimensions introducing point by point. With ARKIplan you can do it in just one movement for the whole plan. 7. MEASUREMENTS. ARKIplan recognizes different enclosures just clicking inside of them. Then you can obtain automatically floor-ceiling-wall surfaces, wall lengths, voids percentage and get an index with all this data which is actualized in real-time with drawing changes. 8. BLOCKS LIBRARY. 2D and 3D. In ARKIplan you can use a block’s library with more than 20000 elements! Every block is displayed by using plants, elevations and 3D views. 9. INSTALLATIONS. With ARKIplan you will get automatically all the necessary electrical installation elements inserted in your drawing. This software recognizes the enclosures depending on the furniture introduced and then it adapts the installations to this condition. You will have a pre-installation design fully editable in seconds! 10. GRAPHICAL INDEX. You can also get a graphical report of every element (related with doors, windows and wardrobes) introduced in your project. 11. 3D MODELS. Automatic 3D models from 2D plans. ARKIplan is the only software able to translate all our different and separate plans in a complete 3D model, including elements like furniture, stairs, blocks...and it can do it using just one order! 12. ELEVATIONS AND BUILDING SECTIONS. Once you have your 3D model you can get sections and elevations and configure them with interesting tools. 13. TOPOGRAPHY. Sometimes it is almost impossible to create 3D terrain models just with 2D plans. With this tool package you will generate 3D surfaces, solids; you can make Boolean operations and section profiles, etc. 14. UTILITIES. You will discover many other utilities which make your drawing process more efficient. Even you can add more drawing utilities installing our free software ARKItool.